In the six-part docu-series “Rest in Power: The Trayvon Martin Story,” the filmmakers Jenner Furst and Julia Willoughby Nason recount the teenager’s life and his deadly encounter with George Zimmerman in a gated townhouse community outside Orlando. Through interviews with key players, including Mr. Martin’s family and Don West, a defense lawyer for Mr. Zimmerman, the directors zero in on what they see as a flawed criminal justice system. They also make an argument that the divisive case (in which Mr. Zimmerman was acquitted of second-degree murder and manslaughter) galvanized both the Black Lives Matter movement and white nationalists. The documentary makes a case for viewing Trayvon Martin’s death and the Zimmerman verdict as a turning point that galvanized progressive political activists and white supremacists alike. Did it help spark your own desire to be more publicly outspoken about politics? I wouldn’t use that as the catalyst. So many things have been going on and the whole climate in America has changed again. I mean, obviously, I think it was the pendulum swinging back from Obama being president. I feel like it was festering and I think the Obama administration just brought those frustrations to another place where people can spread the propaganda of hate. Also, on the flip side, we’re looking at people who, in areas like Middle America, were not really taken care of. You know? They vote for Democrats because their parents voted Democrat and America was a different place at that time. The middle class was allowed to thrive and there was steel in Indiana and the car jobs in Detroit and all these places where these factories were to provide a way for you to start somewhere in low income, get middle class and then maybe end up with the house of your dreams. This was the American dream and it was real. Then that America changed and no one addressed that. The filmmakers and Mr. Martin’s parents hope “Rest in Power,” which debuts Monday on the Paramount Network and BET, moves Mr. Martin beyond the realm of symbolism and demonstrates the costs of ignoring these issues. “I hope people walk away knowing who Trayvon Martin really was,” Sybrina Fulton, Mr. Martin’s mother, said. “I want people to walk away having a clear view of what this country is about right now, and not what they thought it is,” she added. They just needed stems of the recordings that Heron had sent them months before, including a four-bar instrumental loop Michels had created in his spare time, and a few tweaks: a new bassline and strings on top. Days later, Heron got another call: The project was JAY-Z and Beyoncé’s surprise LP as The Carters, Everything Is Love, and the album’s opening track, “Summer,” would feature Michels’ loop. (A bonus track, “Salud!,” featured Butcha’s work.) It was the first time Michels’ music had been sampled since he began working with Heron’s musician management company, BeatHustle, in 2017. Within its first week, “Summer” totaled 9.1 million on-demand streams and 3,000 downloads, according to Nielsen Music, debuting at No. 84 on the Billboard Hot 100. The success of Heron’s new music outfit is a window into how the ­business’ top stars are ­churning out music faster than ever, increasingly soliciting pieces of ideas from a wide range of creators in order to make as many beats as they can in real time. With that kind of ­pressure, the old model of producer as crate digger, crafting melodies out of old soul records or on synths or keyboards, is history. The increase in volume has made it more ­difficult for sampled musicians to claim credit — and payment — for their work, ­creating an opportunity for ­businesses like BeatHustle. In the late 1990s, Heron was part of a community of record-collecting fanatics who would spend hundreds of hours and thousands of dollars digging through record stores for obscure samples, re-recording them onto LPs and selling the breakbeats to producers like No I.D. and Dr. Dre. Diddy, says Heron, would give one of Heron’s record-collecting friends $10,000 to $15,000 just to go shop for records, many of which wound up on Bad Boy albums like The LOX’s Money, Power, Respect. Heron began working with Shady Records in 2013, where he remains vp A&R. But he also started managing ­musicians on the side, beginning with Robert “G Koop” Mandell and AntMan Wonder three years ago, helping them place original music with hip-hop producers. It was then that he realized there was a problem in the production line. An overlooked credit can equate to millions in lost revenue for a musician. G Koop, for example, provided the melodic backbone to Migos’ “Bad and Boujee,” which Metro Boomin flipped into a No. 1 single that has racked up 1.1 billion on-demand streams and 1 million downloads sold, according to Nielsen Music. Heron says that in the past, G Koop might have gotten a few hundred dollars for his ­contributions, and no publishing credit. But with BeatHustle, working with people like Metro and his manager Rico Brooks — the two of whom he ­considers to have “led the charge on fair ­treatment of these musicians” — G Koop is credited as a co-producer. Heron declines to comment on ­specific songs but says he’s often able to secure 50-50 splits with producers. Heron now manages a stable of six composers who, collectively, have contributed to records by Rick Ross, Future, DJ Khaled, Rihanna and others. He has his musicians create original beat packs, which he sends to a tight-knit group of producers he knows and trusts; Cool & Dre, Metro and Murda Beatz, the lattermost producing Drake’s recent No. 1 single, “Nice for What,” are among them. For someone like Michels, who has led several funk bands over the years and worked on records by such artists as Sharon Jones and Lee Fields, the process can be much simpler and more collaborative than just getting sampled. But for producers and artists, particularly in a fast-paced world and in the shadow of high-profile copyright lawsuits like that of Marvin Gaye‘s family against Pharrell and Robin Thicke, the value that BeatHustle provides can make a huge difference. “The musicians and producers, they’re like a community,” says Heron. “That’s what I like to think of BeatHustle as: just music guys.” This article originally appeared in the June 30 issue of Billboard. Jay-Z and Coldplay co-headlined the Barclays Center in Brooklyn last night, and rang in 2013 together. Coldplay frontman Chris Martin sang “Auld Lang Syne” as balloons showered the audience. (Martin’s kids and wife Gwenyth Paltrow can be seen in the video celebrating from the stage, as well.) Jay-Z and the band then went straight into “Run This Town,” which they performed together at the closing of the London 2012 Paralympic Games this past summer. In addition to his own set, Jigga man joined Coldplay for their collaboration “Lost+” earlier in the evening. Beyonce, Christina Aguilera, Taylor Swift and One Direction’s Harry Styles were also at the house that Hov built for the NYE festivities. Yesterday, The Brooklyn Nets unveiled their new colors and logos at a sporting goods store on Flatbush Avenue, across the street from its soon-to-be-completed home arena, the $1 billion Barclays Center. The Nets, who have been playing in New Jersey since 1977, are leaving their red, white, and blue look behind as they move across the Hudson. 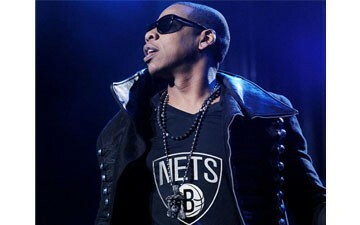 The Nets will be the only team in the NBA with black and white as its only primary colors. The logo and color scheme were designed by part owner Jay-Z and inspired by the New York City Transit Authority subway signs from 1957. Hopefully the Nets’ new colors can translate to some actual wins on the basketball court. Read it at The Huffington Post.